If you’re anything like me, you want to put the best and freshest foods into your body. I’m always trying to find a way to add more fruits and vegetables to my diet, agonizing over ingredients on nutrition labels in the grocery store, and avoiding pre-packaged and processed food like the plague. It’s a battle everyday, as even organic products can have unnecessary ingredients, such as “natural flavors,” which is the food industry’s way of slyly adding naturally occurring toxins to your food (more on that here from the Food Babe). Moral of the story: I try to purchase and eat food in its most simplest form – the way it’s grown in the field. 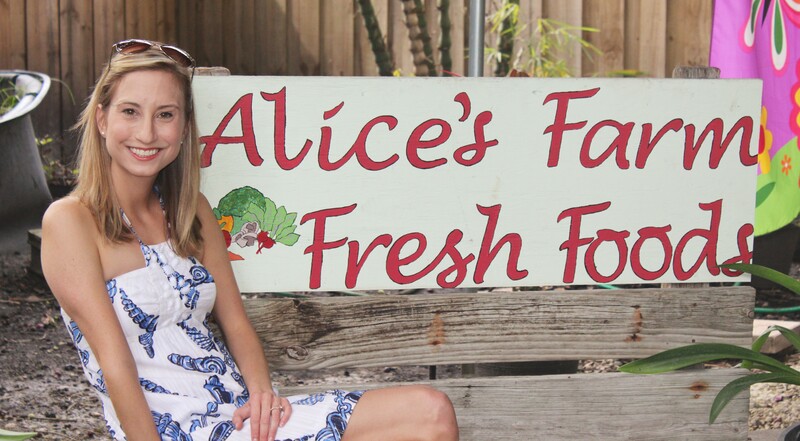 JUP Girl: What is the philosophy behind Alice’s Farm Fresh Foods? Alice: It’s a great thing to bring good, healthy, chemical free food to people. Customers grow food and I buy it from them to keep money in the community. JG: What kind of products and services do you offer your customers? A: I sell produce (mostly fruits and vegetables), grains, and organic products. Note: Alice’s Farm Fresh Foods occasionally offers classes on fermenting. JG: Why is organic and local produce important? A: Organic produce is important because it doesn’t contain harmful chemicals. Local produce supports our community. I am able to get local produce from the farm to my store within four hours. JG: How does a farmer become certified as organic? A: The farmers I get my produce from are “Mom and Pop” farmers and are not certified organic. I know that they do not use chemicals on their crops. To become organic, the government needs to check your soil and continuously test your plants for chemicals. 90% of Florida soil is toxic and contaminated. That’s why my farmers grow their food above the ground. JG: What is the biggest challenge of having a produce store in Florida, especially during the summer months? A: During the summer, nothing grows in Florida because it is too hot. During that time, I use organic brokers to get my produce. The only things that grow in Florida in the summer are okra, long yard beans, and squash. JG: What is your favorite part of running Alice’s Farm Fresh Foods? A: Being able to bring good food to people, especially in the winter in Florida, where you can get food straight from the farm. JG: What is one item in your store that you absolutely could not live without? A: Lettuce! I love lettuce for my salads. Alice’s Farm Fresh Foods is open Monday – Friday, 10 a.m. – 6 p.m.., and on Saturdays from 10 a.m. – 4 p.m. They also offer a delivery service to Jupiter, Tequesta, Juno Beach, and Palm Beach Gardens. Stop by and say hello at 5800 Center Street, Jupiter (on the property of Dix Landscape). Tell Alice that JUP Girl sent you! And here’s some of that delicious orange cauliflower! Love it! I want purple cauliflower!!! You will have to go by and check it out!